I could be wrong, but I think there’s a pretty stereotypical checklist of items you need to complete in order to be considered manly. An affinity for meat. A thirst for whiskey. A love of going outdoors. Flannel. Ron Swanson stuff—and stuff I can generally get behind. But this new RTR truck concept? I dunno. This truck. Just look at it. 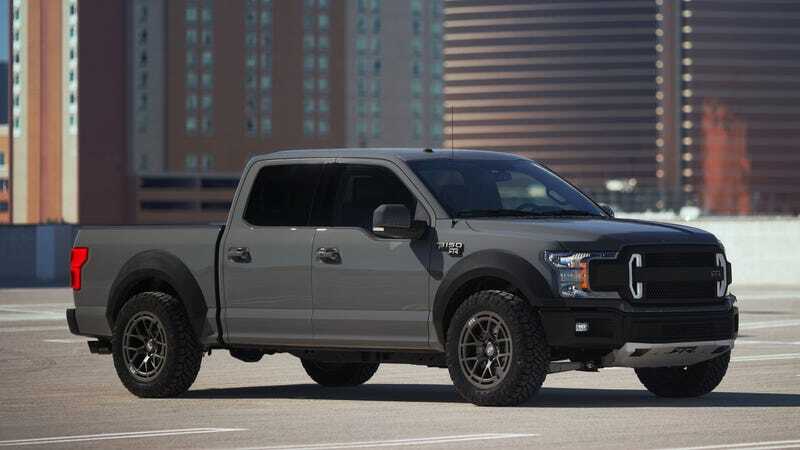 Read its name, chew on it: the Ford F-150 RTR Muscle Truck Concept. Look at all its black trim. My God. I think I need chest hair just to steer it. Inspired by this drift truck, the Muscle Truck has a 5.0-liter V8 (five-oh! ), pushing out 600 horsepower. It has RTR long-travel coilover suspension and 33-inch tires for maximum griiiiiiip. I don’t think I could buy enough Carhartt to ever be well-equipped enough to have “fun” in this thing. Damn! I actually went out and bought a new pair of CAT steel toe work boots in order to write this blog. I wasn’t sure what kind of terrain I’d run into and wanted to be as prepared as possible. Also, can anyone recommend a good wood to smoke moose steaks with?